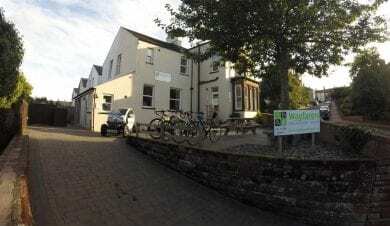 Cumbria Independent Hostels are a local group of Independent Hostels UK. 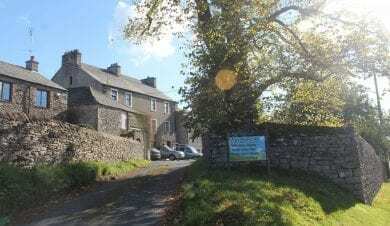 Based in Cumbria and the Lake District these hostels are working together to promote their accommodation. 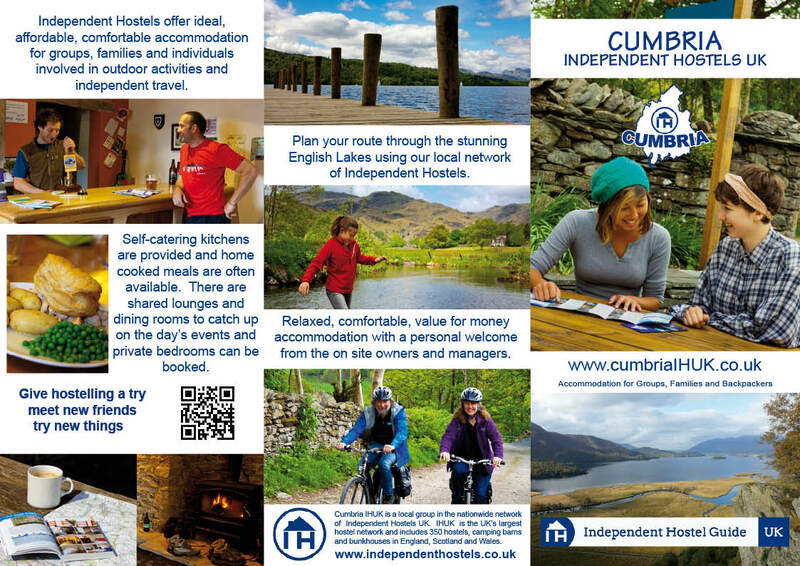 Independent Hostels Cumbria produce a leaflet and have exhibited at Keswick Mountain Show. 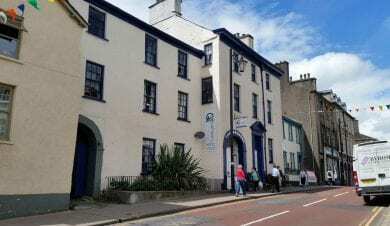 The hostels and bunkhouses are all members of the Independent Hostels UK Network. 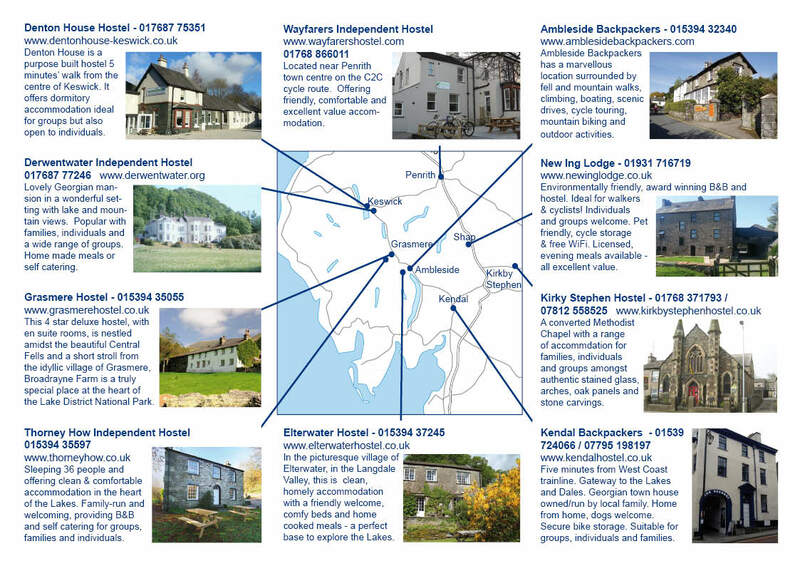 Click on the photos below to find out more about each hostel in the IHUK Cumbria network. Or map of Cumbria. Beds: 56: 1x4, 2x6, 1x8, 2x10, 1x12. Price/night: £17 midweek, £22 weekend. Sole use £900 (midweek). Breakfast £6. Pack lunch £6. Dinner £10. Activities £30/half day. Price/night: From £22.00 (adult), £17.00 (child). Family rooms from £76 (for 4). Ask if you want a room for 2 or 3. 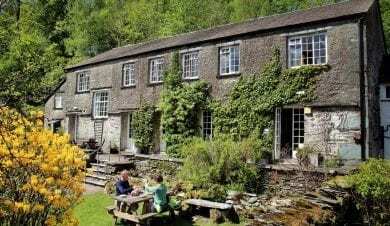 Price/night: From £25pp, £21 in low season. For exclusive hire please call. Beds: 66: 1x12, 1x8, 2x7(fam), 2x6, 1x5(fam), 1x4, 1x3, 3x2, 1xdbl. Family rooms have a private shower room & double bed. Single rooms available also. 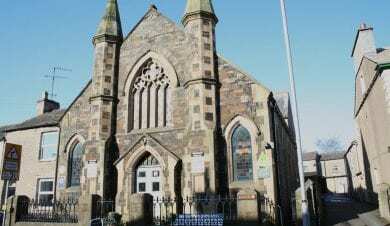 Price/night: £20 Sun -Thurs, £22 Fri & Sat. Sole use from £700 per night. Beds: 38: 1x8, 3x6, 2x4, 1x2, 1x2 en suite. 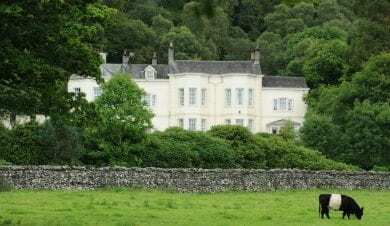 Price/night: £20pp dorm. 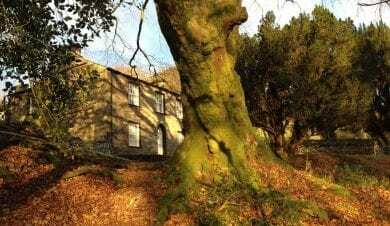 B&B (private rooms) from £55pp. Discounts for larger groups/longer stays. Sole use from only £600. 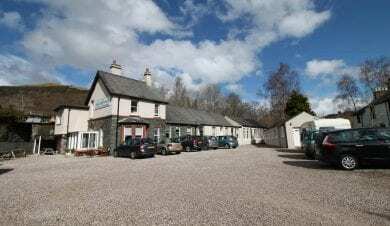 Price/night: Dble en suite B&B from £82. Family en-suite B&B from £100. 4 person budget rooms from £80. Larger catered groups please enquire. Beds: 18: 2x2 (twin), 1x6, 2x4. Price/night: From £23pp (dorm room bed). Sole use from £370pn. Family room: Sun-Thurs from £60. B/fast: £4.Towel: £1.